It may be the age of Netflix, but there’s still plenty of fun to be had enjoying movies the old-fashioned way–and what could fit the bill better than a drive-in? Though many families don’t realize it, there are still lots of outdoor movie theaters around the U.S. where you can watch a film through your windshield or on a picnic blanket, popcorn included of course. Whether you’re looking for a fun roadside attraction on your family road trip, or you just want to spend family movie night somewhere besides the living room, drive-in movie theaters are a fun option during the summer. These are some of our favorite outdoor movie theaters, along with a complete state-by-state listing of all the drive-in movie theaters in the U.S.
1. The 66 Drive-In – Carthage, Mo. Route 66’s iconic drive-in is one of the classic outdoor movie theaters: a historic establishment that looks much the same as it did in 1949 (with a few updates in the actual technology, of course). At the concession stand, you can order fresh hot pizza, popcorn, nachos, hot dogs, pretzels, Dippin’ Dots, and drinks. An original playground is still intact as well, and is available for play before the show begins. Make It a Trip: Go to Carthage’s Kiddieland mini-amusement park, where four fun rides can be enjoyed on weekend afternoons for 50 cents apiece. Stay in nearby Joplin and pay a visit to the Wildcat Glades nature center. 2. Goochland Drive-In – Hadensville, Va. Typically when we think of drive-in movie theaters, we picture surviving relics of the 50s and 60s–and many of them are precisely that. Not so with the Goochland Drive-In, which was built just a few years ago by two parents who noticed a lack of affordable family fun in the area. 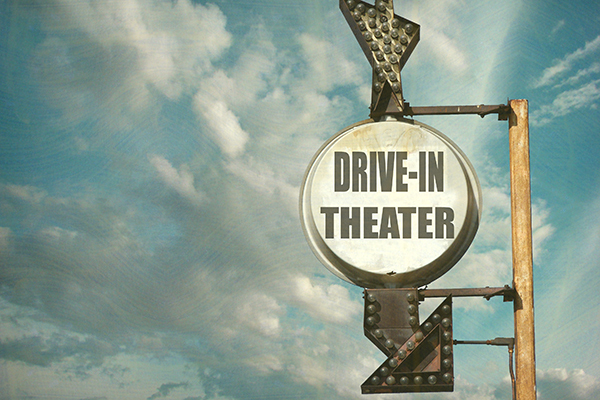 The drive-in features current-release family movies, a playground for kids (it closes when the show starts), and a snack bar serving favorites from nachos and popcorn to cotton candy and snow cones…as well as less common options like veggie burgers and gluten-free brownies. Make It a Trip: Stay about half an hour away in Charlottesville, where you can visit Monticello, go hiking, and sample wine (and grape juice) fresh from the vineyards. 3. 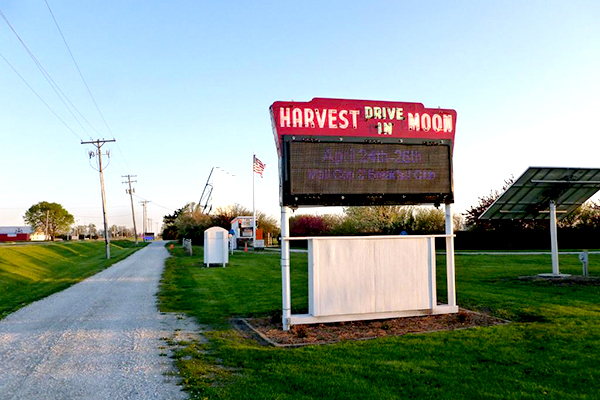 Harvest Moon Twin Drive-In – Gibson City, Ill.
Another outdoor movie theater with a modern twist is the Harvest Moon Twin, which emphasizes sustainability and energy-efficiency. In 2009, it became the world’s first wind-powered movie theater, thanks to its Skystream turbine, which currently creates over 30 percent of the drive-in movie theater’s electricity–with a goal to eventually reach 100 percent. The theater also features energy-efficient appliances, recyclable products, LED lighting, and other earth-friendly components. Plus, you’ll find an excellent snack bar and gift items, and fun special events are hosted throughout the year. Make It a Trip: Catch a college football game at the Memorial Stadium in Champaign, feed the goats at Curtis Orchard, and beat the heat at the Sholem Aquatic Center. 4. Amusement Park Drive-In Theatre – Billings, Mt. Plan to arrive early to this one-of-a-kind outside movie theater, where the kids may be able to spend time enjoying amusement-park rides before the show. There is (or possibly “was”) even a small roller coaster built around the movie screen: as the theater ages, it’s unclear whether this ride is still intact and operational. Check their website or give them a call before making a trip out, as the other rides seem to be closed often these days as well. Either way, you’ll be able to enjoy a film or two while munching on popcorn, funnel cakes, and hot dogs from the concession stand; alternately, you can bring your own food for a $5 fee. 5. Wellfleet Drive-In Theater – Cape Cod, Mass. This cash-only theater is really more of a theater complex, since you’ll also find retro mini-golf, a playground for kids, an old-fashioned snack bar, and the Dairy Bar & Grill featuring burgers, pizza, ice cream, and even beer. If you’re planning to make a day out of it, arrive before 3 p.m. (Wednesday to Sunday) to browse the large flea market for collectibles, clothing, jewelry, and more. Make It a Trip: Hit the Cape Cod beaches, visit the Wellfleet Bay Wildlife Sanctuary, and learn to catch waves at the Cape Side Surf School. 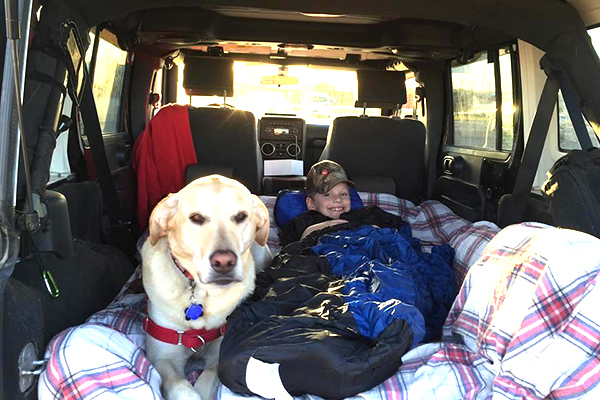 Whereas many drive-in movie theaters stick to films that are suitable for younger kids, the Coyote offers the best of both worlds, with a variety of movies that will appeal to kids (G or PG) or to teens and adults (PG-13 and a few R). The menu at the canteen has similar variance: the food–from pizza to chili cheese dogs–will appeal to all ages, but the draft beer and house wines have a specific audience in mind. Make It a Trip: Visit the lions and tigers (and Safari Splash water park) at the Fort Worth Zoo, step back in time at the Log Cabin Village, and brush up on history at the Texas Civil War Museum. 7. Bengies Drive-In Theatre – Baltimore Md. Boasting the largest outdoor movie theater screen in the U.S. (52 feet high by 120 feet wide), Bengies is the drive-in to hit when you want a perfect picture. The theater dates back to 1956, has a nostalgic atmosphere, and accepts cash only. Their snack bar includes hot meals like burgers and pizza, movie favorites like popcorn and candy, and nostalgic items like soda floats and Sno-Balls–plus fresh-baked cookies and mini-donuts. Make It a Trip: Go eye-to-eye with a shark at the Baltimore National Aquarium, stroll the Inner Harbor, and get hands-on at the Port Discovery Children’s Museum. 8. Shankweiler’s Drive-In – Orefield, Pa.
At America’s oldest drive-in movie theater, the technology has managed to keep up with the times, though you’ll still enjoy that nostalgic feel. The theater strives to maintain a family atmosphere, so the films might not appeal to teenagers, but younger kids will have a blast. The snack bar serves traditional fare: hot dogs, popcorn, ice cream, candy, etc. Make It a Trip: Explore the Lehigh Valley–the Lehigh Valley Zoo (just down the street), Crayola Experience in Easton, the Allentown Farmer’s Market, the Da Vinci Science Center, Dorney Park & Wildwater Kingdom, and more! 9. Delsea Drive-In – Vineland, N.J.
At New Jersey’s only remaining drive-in, you’ll find films for kids and adults, and a menu that you’ve probably never seen at a movie theater before! Although they offer the classics like popcorn, soda, and candy, there is an equally extensive selection of healthy choices, from snacks like fruit, stir-fried asparagus, and hummus with carrots to full meals like shrimp with brown rice, veggie burgers, and teriyaki chicken with edamame. Gluten-free guests have plenty to choose from, and the theater even provides a small selection of Atkins foods. No need to sacrifice your diet here–unless, of course, you want to. Make It a Trip: See a show by the Cumberland Players, visit Wheaton Arts and Cultural Center in Millville to see glass blowing, and walk around the Cohanzick Zoo. Most drive-ins play double features, meaning that you can enjoy two films for a single admittance fee (which are typically dirt cheap to begin with!). Also note that at most of these establishments, bringing outside food/beverages is prohibited and can result in expulsion. They don’t make much money from the tickets alone, so load up on concessions and think of it as supporting a fun community activity. Full List of Drive-In Movie Theaters in the U.S.
Ford Drive-In Theater, Dearbon — the largest drive-in theater in the U.S.! Shankweiler’s Drive-in Theatre, Orefield — the oldest drive-in theater in the U.S.!